Very long time lurker here. 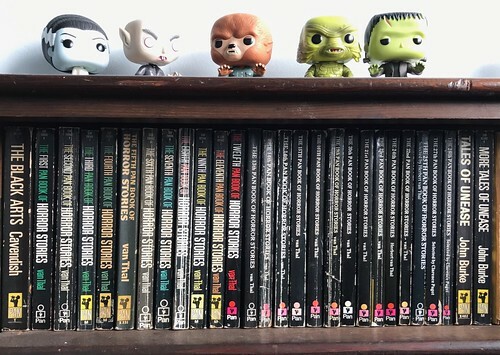 I am a keen (although amateur) collector of pulp horror and wondered if you had a thread dedicated to 'Shelfies.' Terrible word but basically I mean some photos of your book collections. 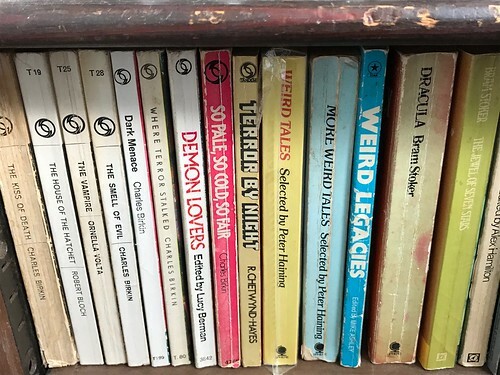 I do love to swoon over rare paperbacks, complete sets or a nice selection of unbroken Pan horror spines. Does this exist on here? If not, can we make it so? My collection is probably pretty meagre compared to most but I'll show you mine if you show me yours and all that. I need no encouragement to show off! I hope you find them (somewhat) interesting and would love to see your shelfies too! Awesome photos, Scarlett! But as a librarian, I'm supposed to warn you that stacking your books as opposed to having them properly upright on a shelf wears them out. You would then be expected to politely ignore all the stacks of books in various rooms of my own house. Does the cloth edition of The Price of Fear feature a frontispiece photo of the Immortal Vincent? One of my greatest fears would be forced to live without any Vincent Price films in the house. I saw him onstage playing Oscar Wilde in the 1970s... beyond brilliant... a divine presence. Thank you! I think you mean my copy of "The Taste of Fear", not "The Price of Fear". Sorry, but there's no photo of the great Vincent Price in it. If I had space to put books upright in my basement "book nook", I would but sadly I have no choice. I have 4 shelves of upright books upstairs, and 2 cabinet drawers filled with others that currently have no shelves to call home. 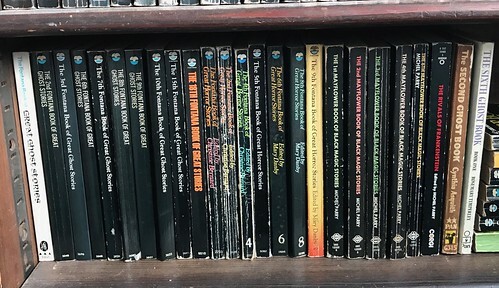 The Terror Tales are a series of books that I'm sure you'd enjoy, and are fairly reasonably easy to find online. I have most of them, TT of London, Wales, The Seaside, The Lake District, Yorkshire, etc. They're heavily described elsewhere in the Vault. TT of Cornwall is coming out soon, I can't wait for that one! I hear you, Scarlett, about the difficulties of shelf real estate. It is a source of constant deliberation on my part. My comment about the Cotswolds had to do with another Vault denizen saying something like "who could repress a shudder" upon contemplating what one of the brief visitors 7 years ago described as "the simple pleasures of life in the Cotswolds." It made me think of this skit Catherine Tate used to do on her show in which she played a character called the Posh Mum. The Posh Mum seemed to live somewhere like the Cotswolds and her life was an unending train of horror, often revolving around learning that her child's yogurt was one day past its sell-by date, or that the eggs being used in a spoon race weren't organic. I work in Cambridge Massachusetts and the town is full of the American version of the "Posh Mum." I read some of those threads about the recent updates of the old "Tales of Terror" anthologies from the 1970s. Have you found the story selections to be consistently engaging? A lot of modern horror seems to reflect concerns I personally don't engage with and I usually can't get beyond page 2... If the tales are more of the old fashioned type of horror, perhaps I'll give one of the books a shot. I'm enjoying Frederick Cowles at the moment but some of his stories were old fashioned when he wrote them in the 1930s and 1940s. In terms of moderns, I think I mentioned a few months ago checking one of Mark Valentine's books of tales out from the library and finding the stories, though beautifully written, to lack any real point or even, at times, actual incident. I am intrigued to explore Reggie Oliver's oeuvre and will probably put one of his collections on my "kindle" device at some point. Also meant to say that I've enjoyed stories by William "Willie" Meikle and John Linwood Grant, but again, both were pastiches of earlier work. I'm a sticky old thing so my likes and dislikes are indicative of nothing beyond the tastes of an old New England freak. Does the cloth edition of The Price of Fear feature a frontispiece photo of the Immortal Vincent? Also .... welcome MS Palmer. Thank you for registering and I hope you enjoy your time here. Hi MissScarlett - thanks for sharing! Great photos. I have several incomplete collections actually! Fontana Horror, Fontana Ghost Stories... but then part of the fun is collecting isn't it? I think this type of book is particularly hard to come by now. When I was a kid the charity and second-hand shops seemed to be full of them but now I only really see them going for a song on eBay or Amazon. Anyway, I'll post my pics below... had a bit of a job figuring out how to insert images. 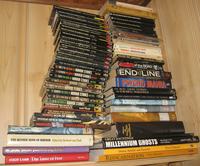 I do have newer books too! Good to hear a Reggie Oliver recommendation. I've enjoyed two of his short stories in various anthologies and always meant to read more.